Snow starting to accumulate on the tent. 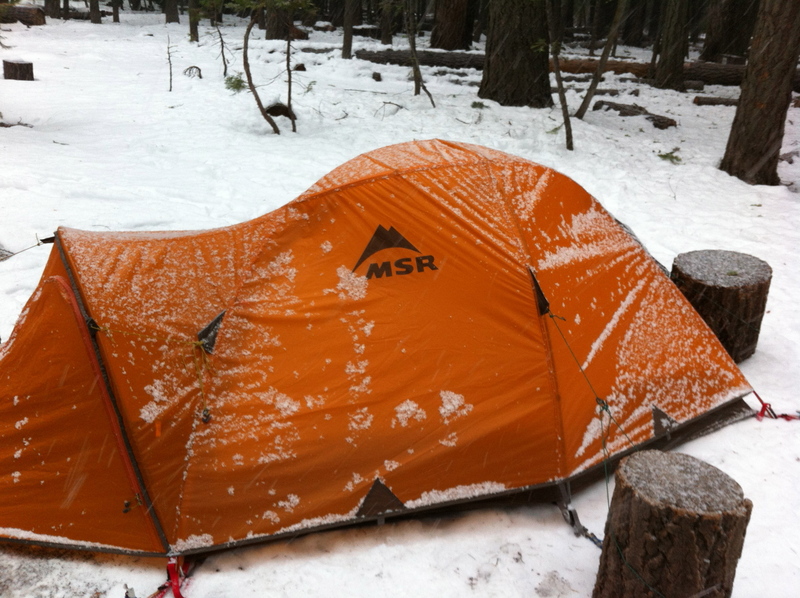 I awoke early Sunday morning to the sound of sleet hitting the tent. It was still dark, so I stayed in my sleeping bag for a while wondering how much had fallen through the night. The sides of the tent weren’t sagging in, so I figured it couldn’t be much, if any. As the sky got brighter, I poked my head out the door. No snow yet, but it was definitely starting to come down. By the time we were up and ready to do some hiking, there was a nice layer beginning to form on the tent and the snow flakes were starting to get bigger. 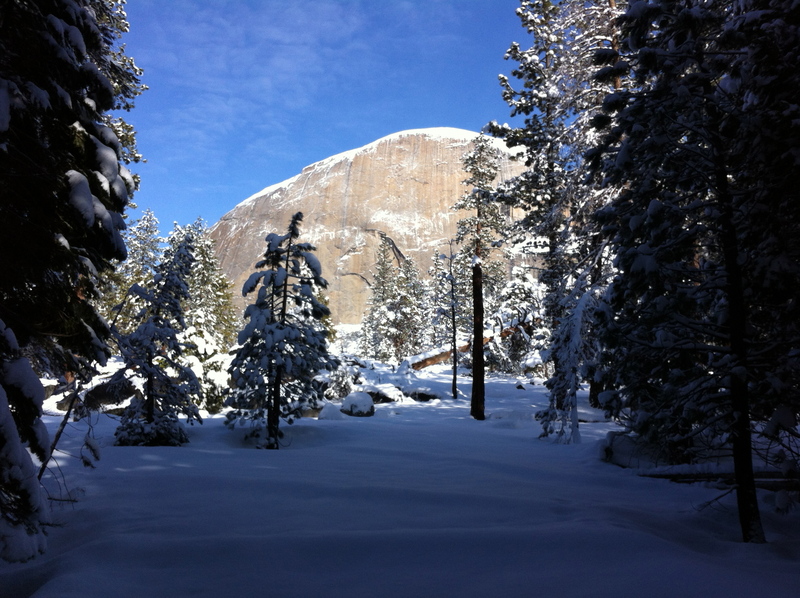 This was the first time I had seen it snowing since I moved to California 3 years ago… Exciting! Since our camp was sheltered by the trees, we were a bit surprised to find that 2-3 inches had already fallen when we got to the clearing by the stream to fill our bottles for the day. The snow was light and fluffy, and the air was still and quiet. 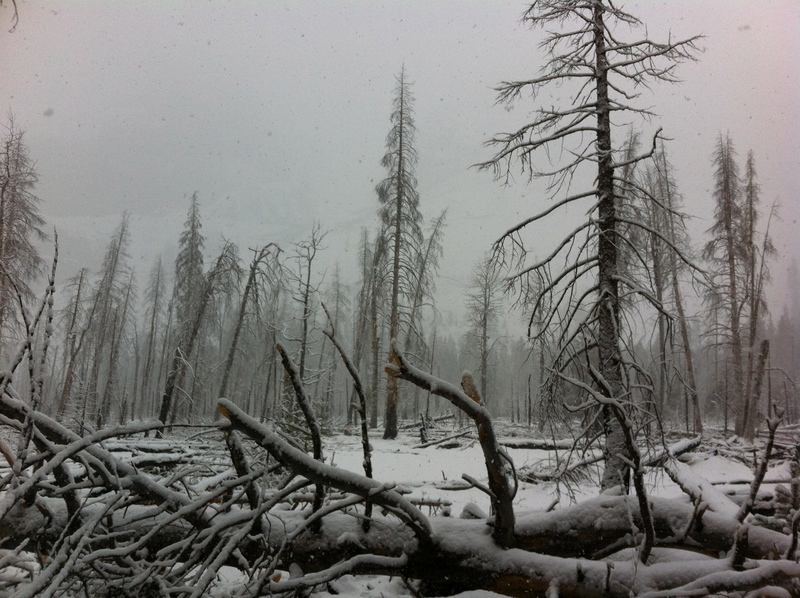 Trees left bare from a recent forest fire. 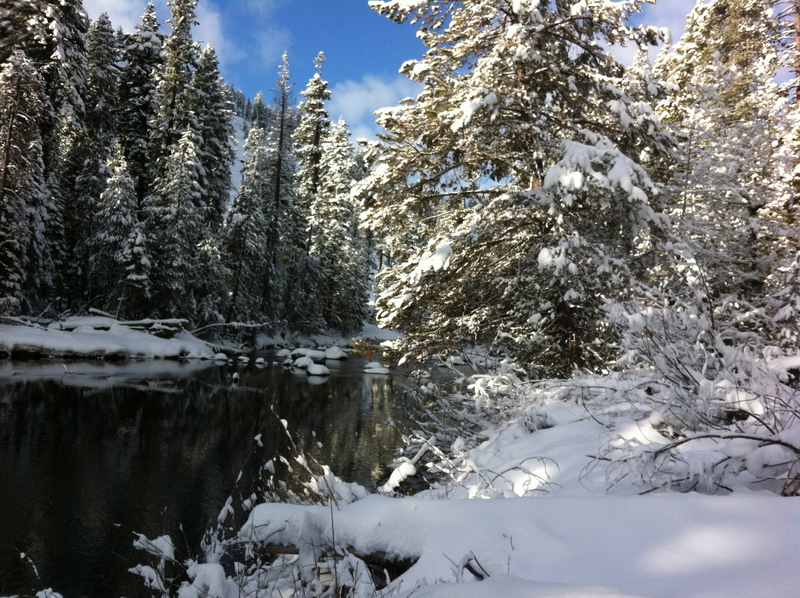 We had decided that we would follow the Merced River Trail a few miles before having lunch and returning to camp at LYV. The trail was marked with old tracks that were quickly being covered by the new snowfall. Our path was also frequently blocked by fresh tree fall. As we continued, we passed through a section that looked to be recovering from a recent forest fire. The bare trees looming in the falling snow carried a much different mood than the rest of the trails we had been on. Fire damage in combination with the wind storm that moved through CA last fall was probably responsible for all the downed trees. The trail maintenance groups will definitely be busy this spring. The trail continued following the river through the valley with very little elevation gain. 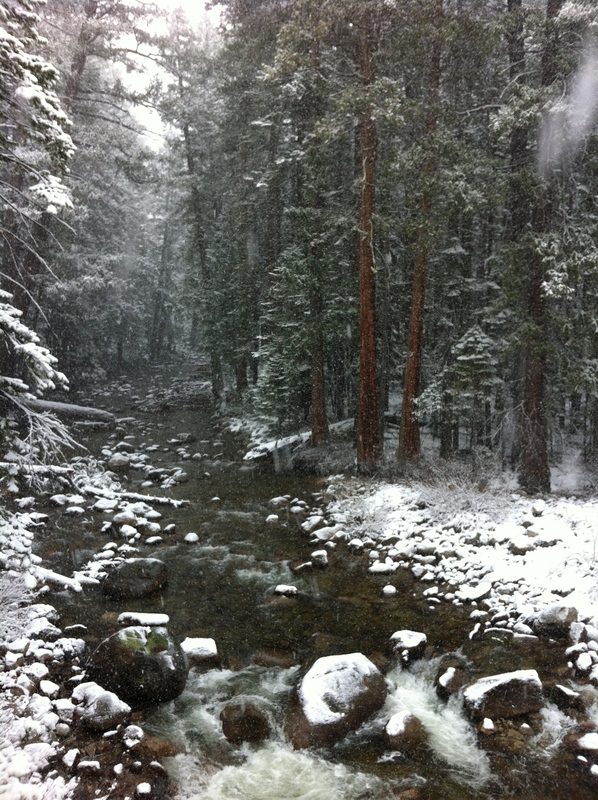 As the valley narrowed we got some to see some beautiful scenery as the snow fell silently on the river. Continuing up the trail, we came across a couple tricky stream crossings. 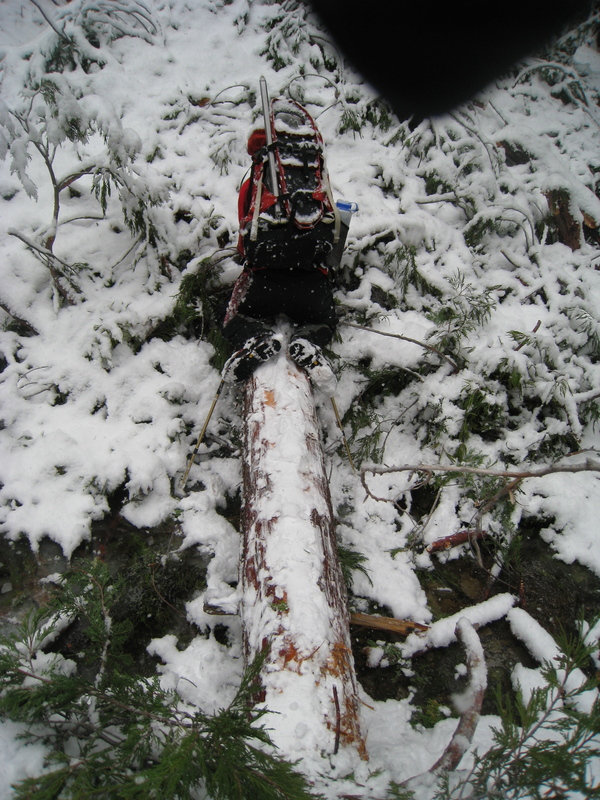 The snow had made the trees slick and hid many of the holes between rocks and logs making navigating the crossings extra tricky. After straddling a few trees, we arrived at a perfect swimming hole (were it a few degrees warmer of course). From here we climbed along a large water slide that looked like a perfect launch point for the swimming hole. A short while later we came across a second swimming hole with the same water slide entry. During the summer these probably get plenty of attention, but on this day, we had them all to ourselves. At this point we made our way up a short series of switchbacks heading further up the valley. We could feel the temperature dropping and the snow and wind began to pick up. It was now about noon, so we decided it was time to think about lunch. 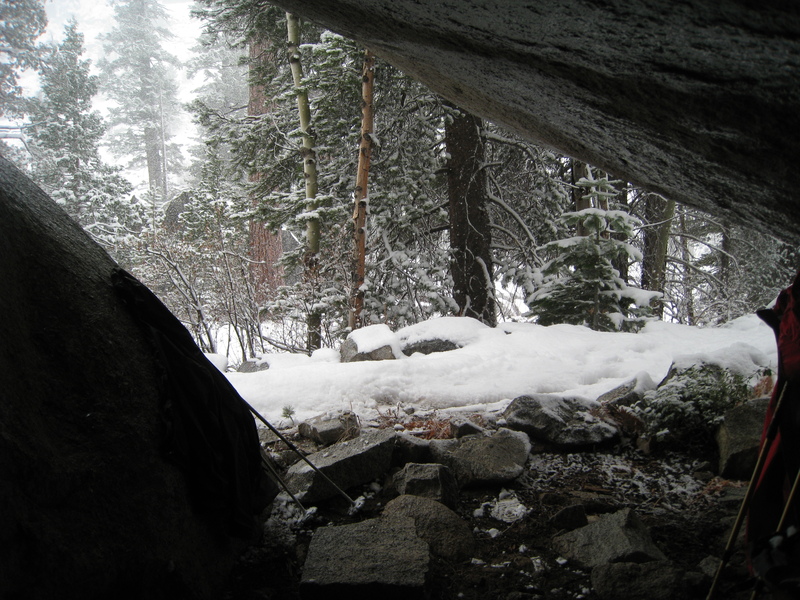 A short ways up the trail, Paul found a small cave that we took shelter in and enjoyed lunch while watching the powder fall. It had become very humid, and our rain gear was becoming damp on the inside, so it was nice to get out of the weather and air out the jackets a bit. After having some lunch, we decided it was probably a good time to start heading back to camp. We estimated we had gone about 4 miles, and the return trip would be slower with the deeper snow. As we loaded up to head back, we had to shake off our rain jackets, which had iced over during the break. It was definitely getting colder. The snow had also picked up and, now approaching a foot deep, nearly covered the tracks we had made only 30 minutes earlier. Descending the switchbacks became significantly more tricky with the added snow. 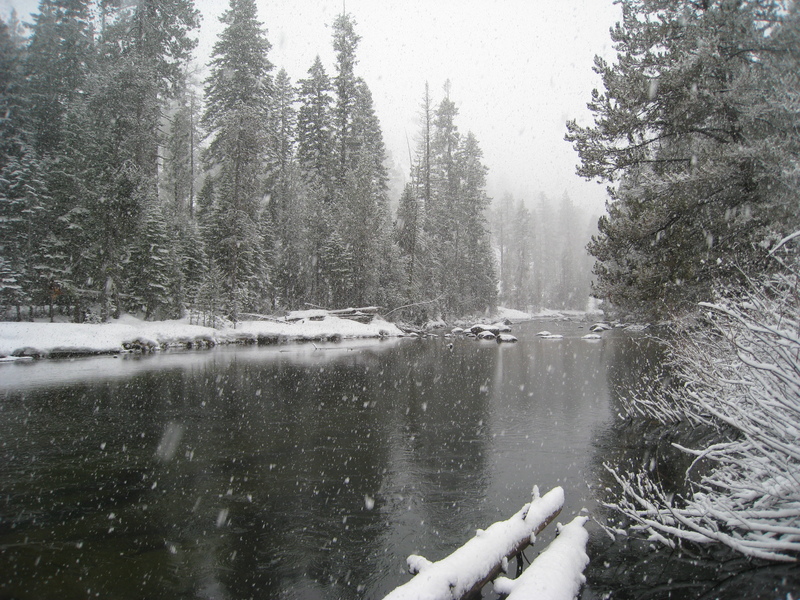 The fresh powder hid a shallow stream flowing between many large loose rocks. It was slow going. Where did the tent go!?! As we neared camp, the snow had pilled up to easily a foot! Making our way through the trees, I was looking out for the bright orange rain fly of the tent. I knew we should be close, but I wasn’t seeing it. 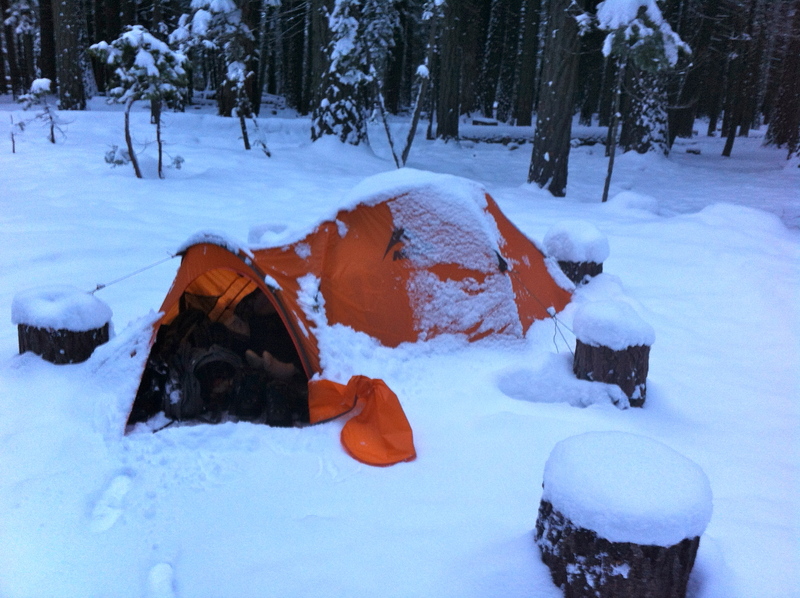 Walking into camp, we found the tent buried under several inches of snow. It was a very good camouflage! Snow cover from the night. Shortly before dawn we awoke in a very humid tent. Everything had a layer of moisture on it and the ceiling of the tent had started dripping on us. 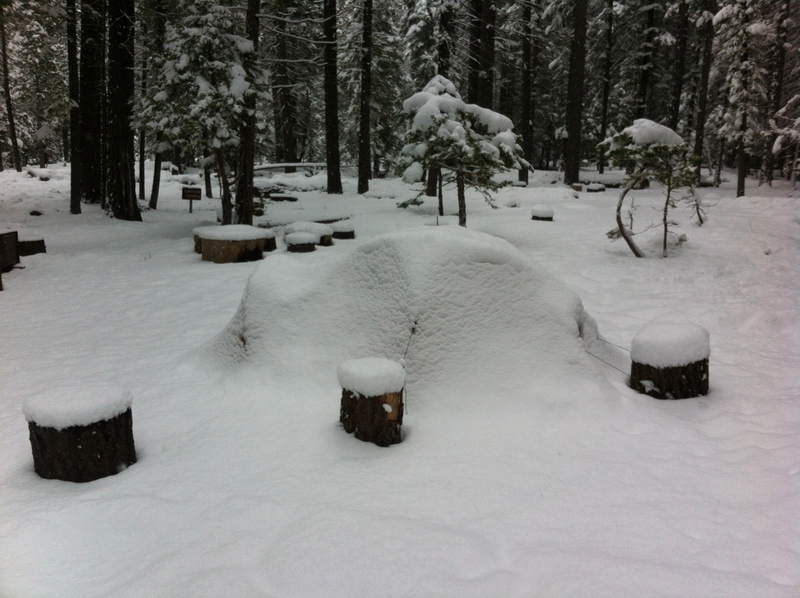 It had continued to snow through the night and deposited another few inches on the tent. This blocked our ventilation and turned our cozy tent into a humidity chamber. We knocked off what snow we could from the inside and unzipped the door since it had now stopped snowing. An hour or so later, the sun started coming up and we emerged from a snow covered tent under a bright blue sky! After a quick breakfast, we packed up camp and started our way back down the valley. All the previous tracks had been covered, and we were breaking trail through about 15 inches of powder. It was slow going, and we starting making guesses as to how far we would get before encountering day hikers. As the sun climbed higher in the sky, the trees began dropping the piles of snow perched on their branches. I seemed to be a more favorable target than Paul as I ended up with a much larger amount of snow down my neck than he did. 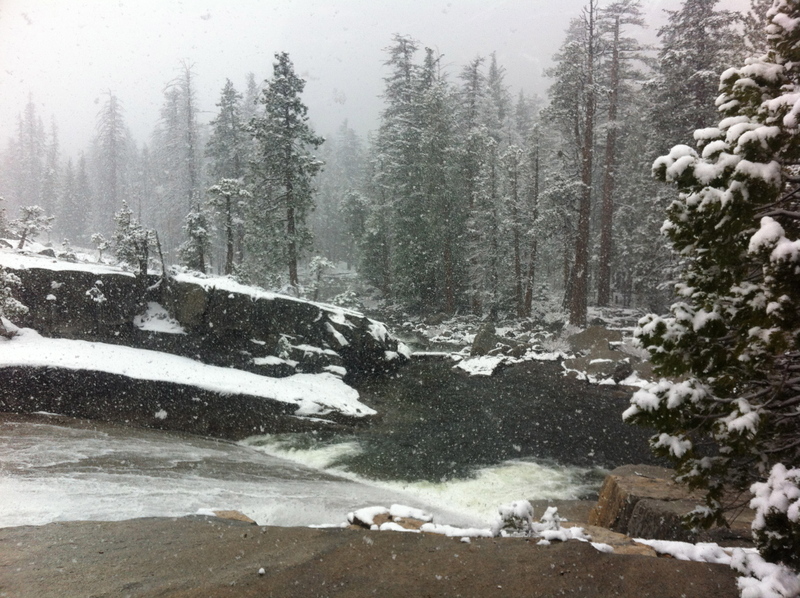 The trail began to descend towards the top of Nevada falls at the intersection of the JMT and the Upper Mist trails. It wasn’t long after this intersection that we decided to take off the snowshoes. 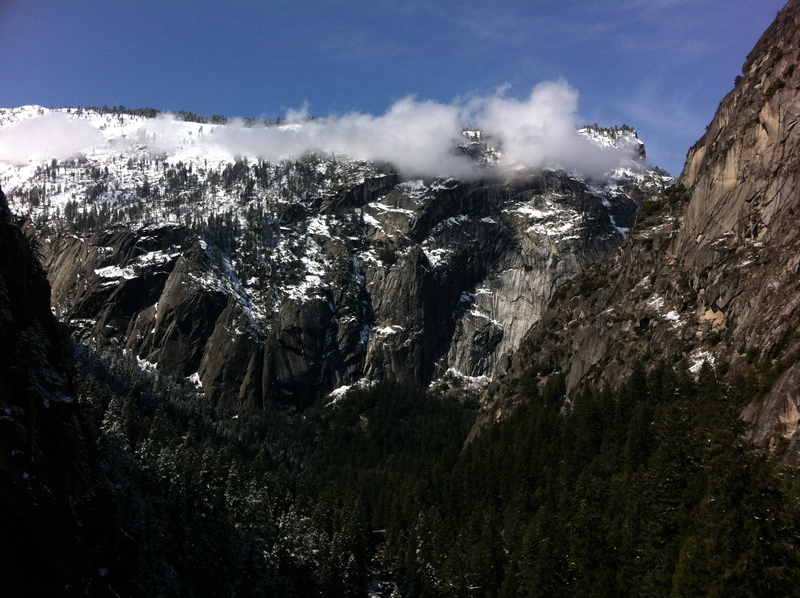 When we reached the top of Nevada falls we came upon the first group of day hikers. There were around 10 of them and they looked a bit surprised to see two people coming down out of the high country. The snow was still about 12 inches deep, and they were significantly under prepared for the conditions. 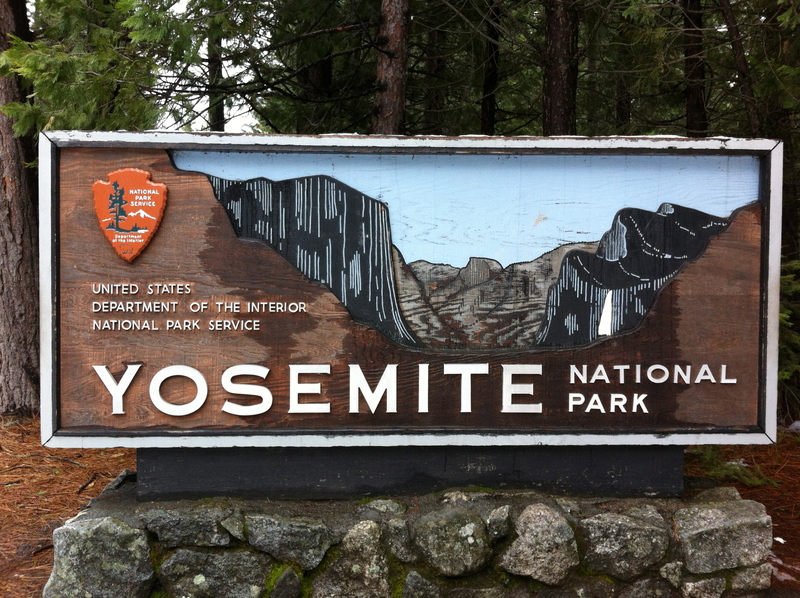 With one backpack between the 10 of them, only a few water bottles, soggy tennis shoes, and two of them in shorts and t-shirts, they asked if they were heading the right way for Half Dome. They were, but we told them that the cables were down for the season and that the snow only gets deeper from there with no tracks leading up the Half Dome trail from LYV. They were undeterred. 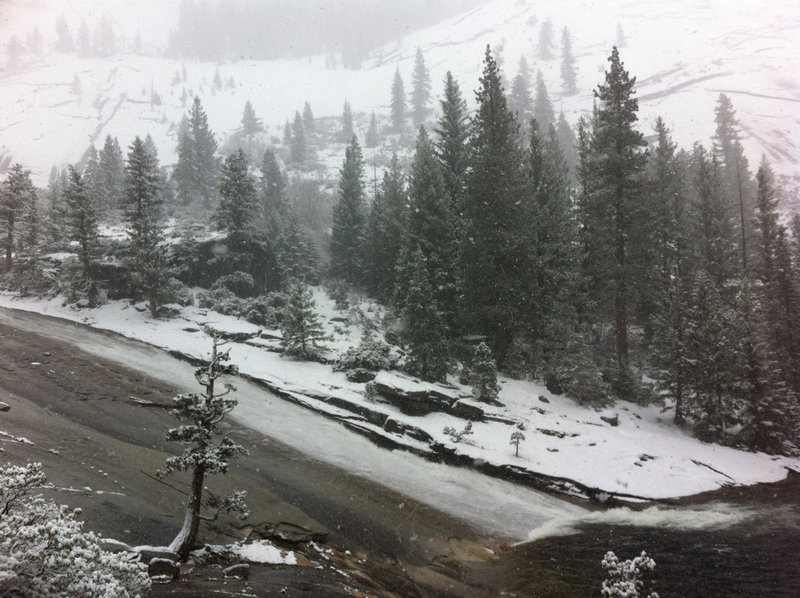 As the elevation decreased, the snow turned from powder to packed powder from day hiker traffic to a heavy wet layer on a soggy trail. 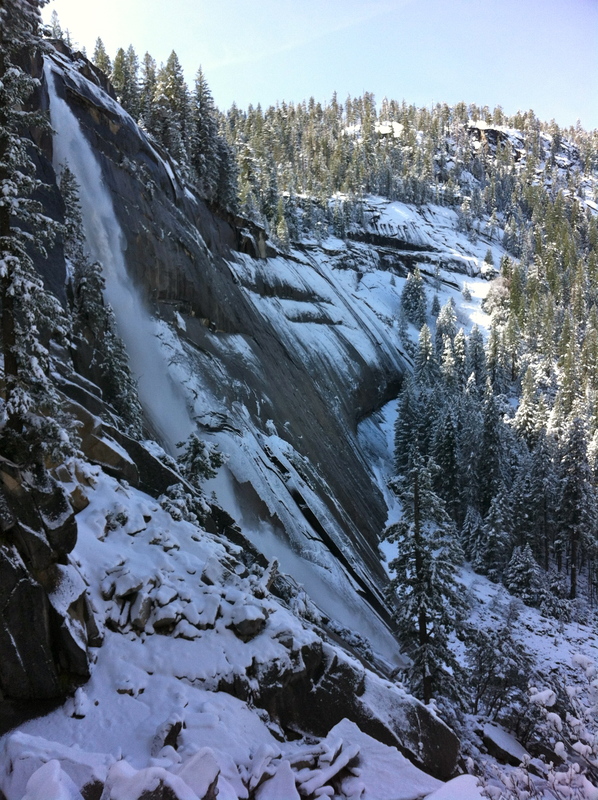 We continued descending until we reached the top of Vernal Falls where we stopped for lunch. Relaxing at the falls overlook, Paul made the observation that this was probably the only time of year that you could be alone at this spot. This was probably true. My previous visit to this spot was in October 2009 and I was in the company of 20 – 30 others taking turns standing at the rail for a quick photo. The solitude was nice and being able to enjoy the moment rather than being pushed aside by someone else wanting a picture was even better. After lunch, we continued down. The trees were now dripping under the warmth of the sun, day hikers were a regular sight and we soon joined with the portion of the trail that was paved. After many, many switchbacks, we finally reached the valley floor. My knees were happy to be traveling on flat ground again, but my feet were looking forward to getting rid of the pack and having a seat at the car. A long mile later we had arrived! We loaded up the car and changed into some fresh clothes (Except for Paul’s shoes… he had forgotten to bring road shoes and was stuck with some soggy boots… bummer!). But a trip to the Valley would not be complete without taking a dip in the river! Unfortunately, Paul could not be convinced, but I made a quick, and chilly dip in the river before hitting the road back home! It was the perfect end to a great trip! 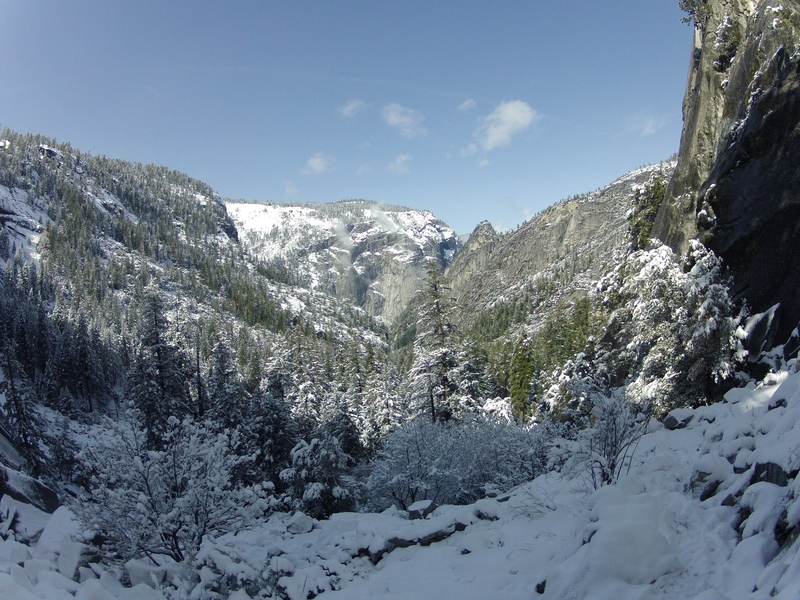 This entry was posted in Backpacking, Winter Backpacking, Yosemite NP and tagged Nevada Falls, Snow Shoeing, Vernal Falls, Yosemite National Park, Yosemite Valley by Country Kyle. Bookmark the permalink.